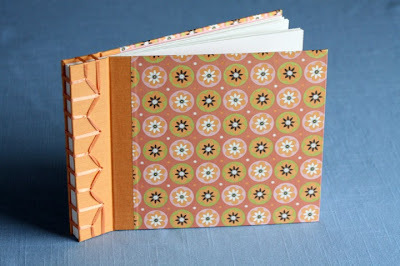 This cheerful, stab bound album comes from Katie at LinenLaidFelt. Covered with patterned paper and bookcloth and bound with matching ribbon, it's the perfect size for 4x6 pictures with room left on the pages for captions. I suspect this may be filled with baby pictures soon! Katie's books and more are in her shop: www.linenlaidfelt.etsy.com. Lovely - great color choices! I need to start making some like that. 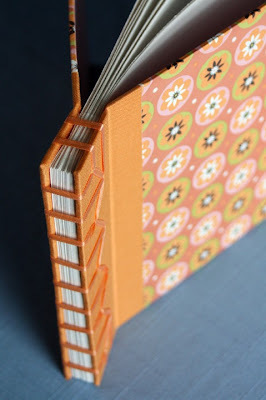 Perfect for a little brag book! Beautiful work!